Montségur … Rennes-le-Chateau … names indeed to conjure with. Mary Magdalene, and Otto Rahn, Esclarmonde de Foix and Indiana Jones, all part of the same story? The thirteenth-century Cathars slaughtered at Montségur in 1244 today offer an alternative to mainstream Christianity that for many integrates better than the Church does with modern ‘new age’ attitudes. Catharism is used to focus a sense of local pride and independence in the Languedoc of France and its martyrs offer a symbol of largely nonviolent resistance against persecution and near-genocide. While they are the source for substantial studies into reincarnation, they also give us extraordinary detail to help us understand mediaeval life and the horror of the Inquisition. Their spirituality and what it stood for remain alive in countless exemplary ways. THE CATHAR VIEW offers the perspectives of roughly twenty-five different contributors. They range from armchair history to alternative and esoteric. Contributors include Shannon Anderson and Patrice Chaplin. Hear the results of an interview with Henry Lincoln (of The Holy Blood and the Holy Grail fame) and read a rediscovered article on the Cathars by legendary Thirties author Maurice Magre (The Return of the Magi). Read in full the inner encounter Grace Cooke had with one who conveyed the full spirit of St John. Other contributions bring us into contact with Otto Rahn, who for many is the original for Indiana Jones, and we look at some of the occultists who have been intrigued by the Cathar inheritance, such as the mysterious Polaires. There is a memoir of the legendary Arthur Guirdham. Relaxing, we take a loving look at the landscape of the Languedoc and what it holds for walkers and mystics alike. THE CATHAR VIEW does more than satisfy curiosity: it may change your whole perspective on life. DAVE PATRICK, the editor, follows the format of two very successful titles to which The Cathar View now forms a companion: The View, which was about the spiritual legacy of Sir Arthur Conan Doyle, and The View Beyond, which dealt with Sir Francis Bacon and his programme of learning. A sometime Shell oil executive who left to pursue complementary medicine, he has spent most of his life on the East coast of Scotland. 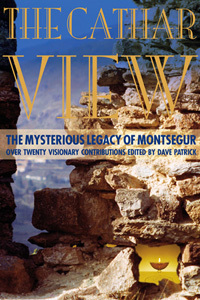 The Cathar View: The Mysterious Legacy of Montsegur collects essays from twenty-five learned contributors, including a memoir of Arthur Guirdham, about the Cathars, a splinter sect of mainstream Christianity that was horrifically persecuted and exterminated in medieval times. Also covered is the faith's modern revival as neo-Catharism, and its interplay with the occult. An inset section of almost fifty color photographs illustrates this eclectic and multifaceted examination of a profound religious tradition, which explores with the tenets of the Cathars have to say about both mundane and spiritual life today. Highly recommended.